Back to my updates ~ of tips from professionals in the Travel/Tour industry. Mariann Millard, Professional Tour Director, offered this tip about the Boston region: "a favorite of mine is exploring Beacon Hill on foot with its narrow streets and ecletic shops." Do you use a Travel Professional (agent) (TA)? They have the knowledge, will be able to steer you away from the internet deals and inferior internet travel companies, and support you through your travels. A valid TA works with other bonded companies as suppliers. Yes, they do have ways to save dollars if this is what you are searching for. The TA will also give you the value for the dollars you do spend. Remember with all the mergers and acquisitions in the corporate world, how do you know whether a company is still valid and strong? If you see a great deal on the internet, it is probably too good to be true. Ask questions and call you Travel Agent (TA). Vacations are a time to get away, relax, and enjoy. I recommend you connect with a valid Travel Professional to assist you with your plans, before, during and after your trip. A Travel Agent (TA) assists the planning before and after your trip. 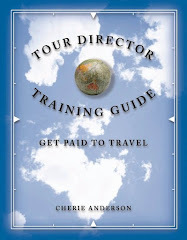 A (paid) professional Tour Director is with you during a tour – they manage your needs. They are NOT just a leader escorting the trip for free.